Operating JESSY DEEP is optimised for an easy and fast operation as well as suitable for all field conditions. 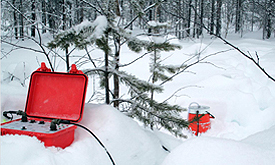 After positioning the measuring unit, the control unit will be connected and placed in a few meters distance. After that the measurement is initiated with the button auto tune. A couple of minutes later the measurement is completed and it can be continued with the next position. Batteries need overnight recharging and the system needs refilling with liquid nitrogen every day. A short introduction and training is enough to be put in the position to work with the system. 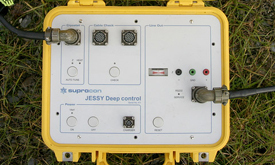 JESSY DEEP is approved and succesfully applied in many exploration campaigns in the world. It is robust and field proof. SQUID EM receivers have in the past led to several findings of major conductors and established the reputation of a highly innovative and powerful electromagnetic tool for geophysics.